and make memories while making homemade pizza for PizzaMovie Night Monday (yes, pizzamovie is one word in our house…pizza and movie always goes together) and bake cookies. 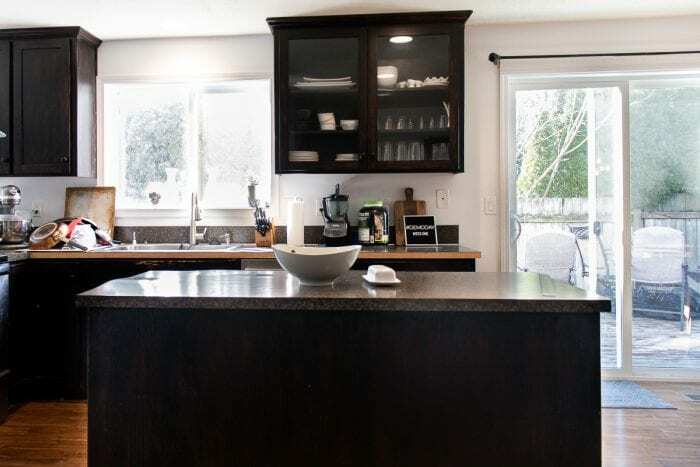 When we bought our home six years ago the first thing we did—before we even moved in—was makeover our honey oak kitchen cabinets with a dark faux stain. 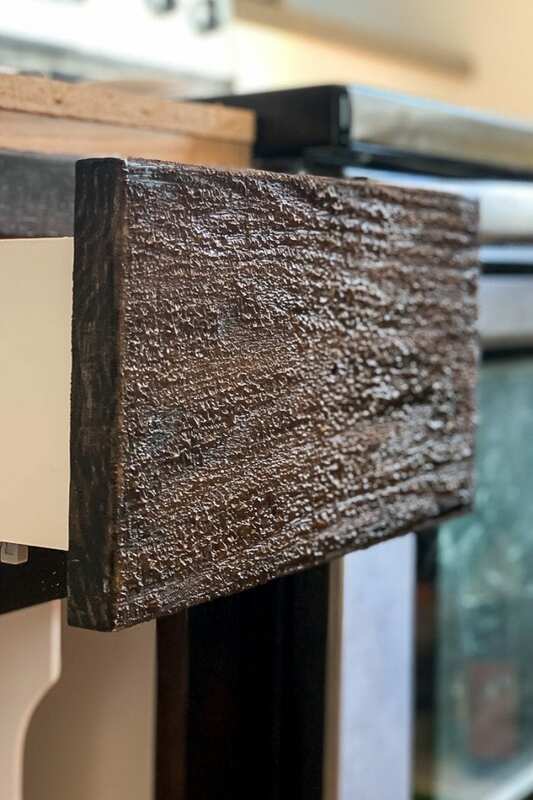 We hated the raw wood look, knew we liked dark cabinets and decided to just go for it. 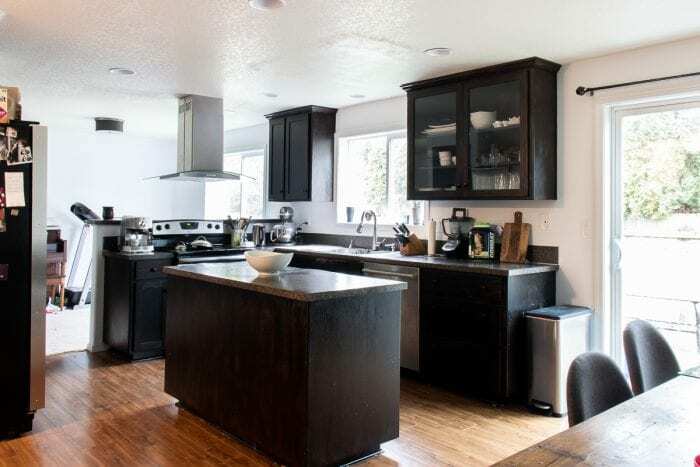 After our family grew and I stopped working full-time though, I spent much more time in our kitchen and main living area and as my struggle with postpartum depression grew I felt the walls closing in. The dungeon—as I liked to call it—needed some serious changes. 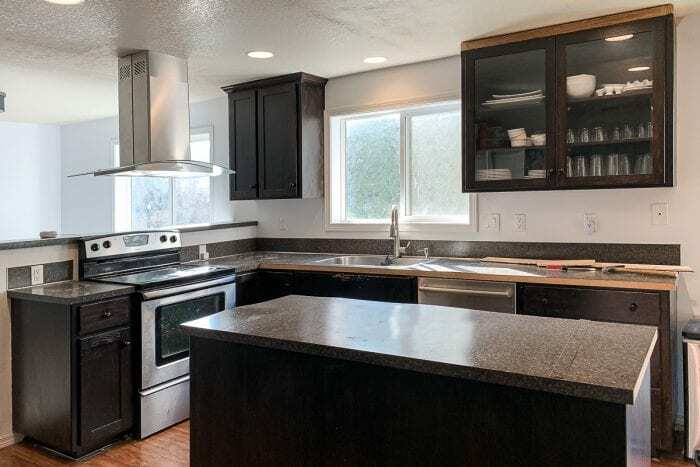 We’ve thrown around many ideas including adding windows to walls, but ultimately we knew the kitchen needed some work, but it just seemed so daunting to tackle. 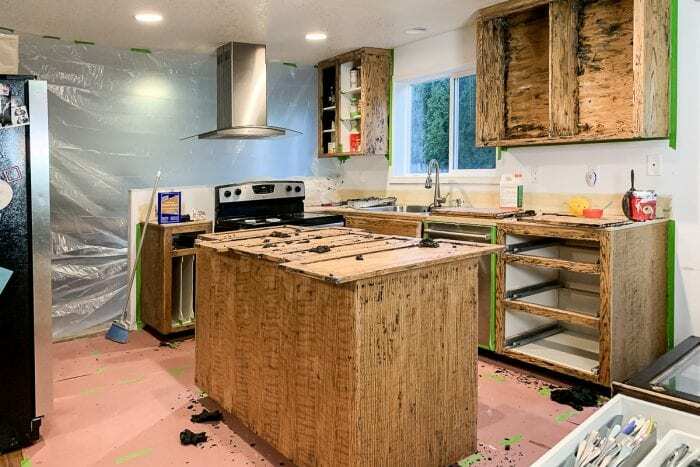 I’m so glad Jeffrey Court invited me to participate in this 6-week renovation challenge. This was the push we needed to finally tackle this space we spend so much of our time in. Over the next six weeks I’m going to take you along for the process as we make over our kitchen! Each week will be judged by Jeffrey Court, you will get the opportunity to vote, and one designer will win a $5000 dream vacation! One year ago, we took on our master bedroom in six weeks and transformed it into the monochrome modern master that moody dreams are made of. Every day I’m still in awe over our bedroom and love everything we did in there. I can’t wait to makeover a space we spend so much of our time in. 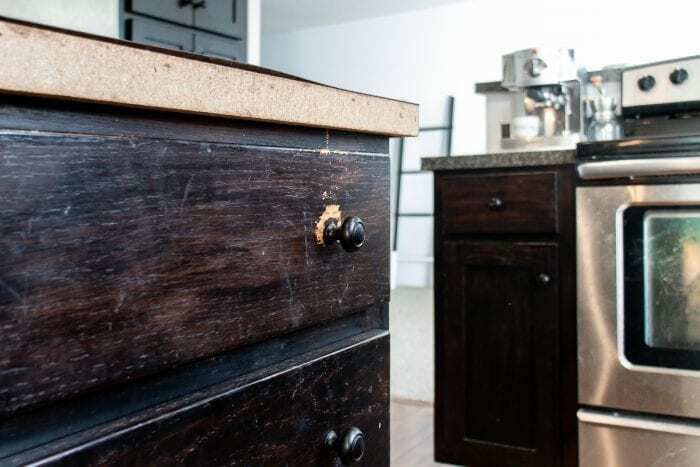 I’m excited to take you along for the process as we take on our kitchen and transform it! It may not look that bad, but once I show you all our issues, you’ll see why I’m ready for a serious change! First off, the light. Although this picture looks like there’s natural light aplenty, there’s actually very little due to a row of tall arborvitae lining our south fence and absolutely no windows on the east or west side of the main floor of our house. It feels very gloomy and outdated. Check out this video for a walkthrough of the space, our problem areas, and the progress we’ve made so far in just one week including some fun timelapse clips of the progress! Not a video person? No problem! 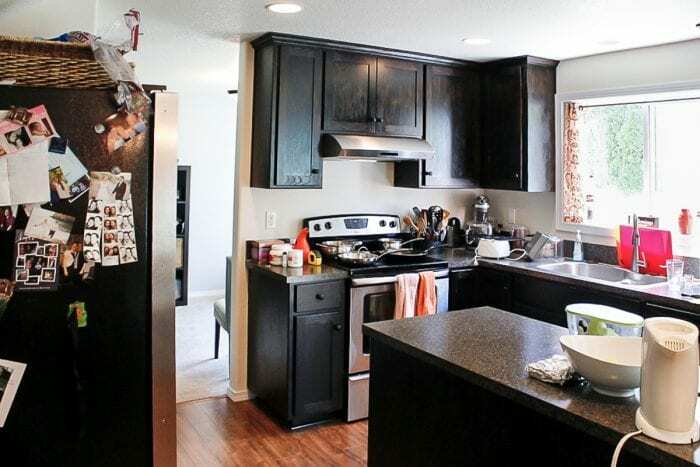 Let me give you some more details on our kitchen and dining area. About 4.5 years ago, we decided to cut down this wall behind the oven to be a half wall. Our dining room was originally in that area behind the oven, however, that didn’t make sense with the way we used our home. We removed the cabinets, cut down the wall to open up the space some more, and added a bar counter to the half wall. However, the bar counter never got used and just became a home to store our junk or papers. So, the first thing we planned to do was remove the counter and cap off the wall. 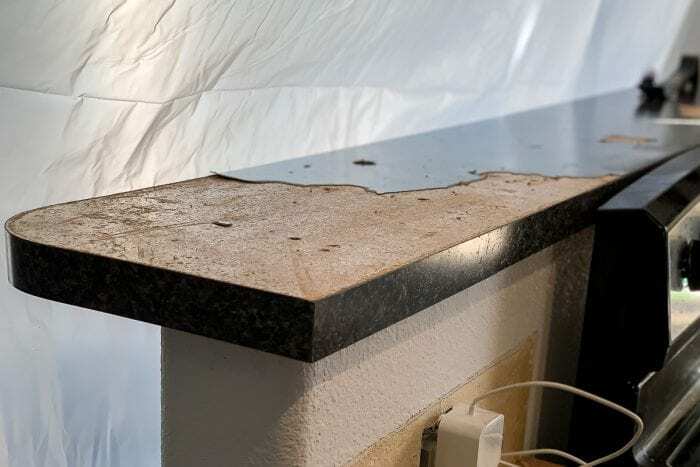 Let’s just say the countertops need to go. Besides the fact they are cheap looking and all peeling up, they are just way too green, and make an already dark space even darker. 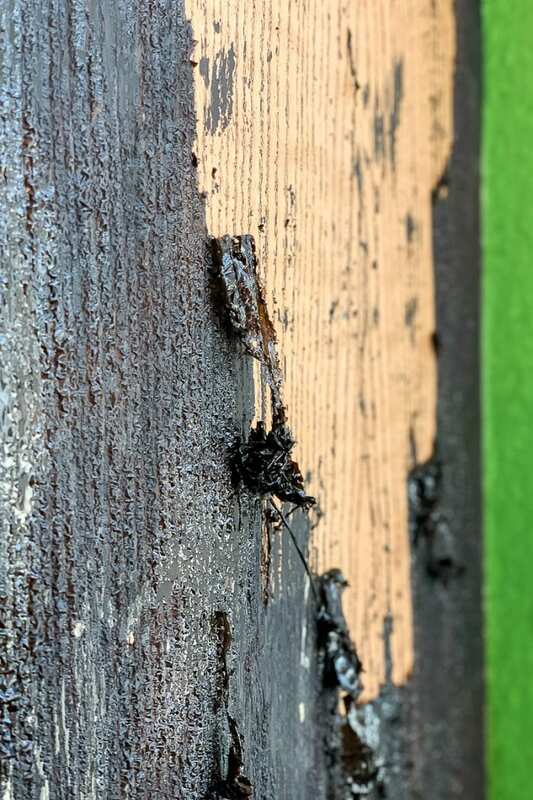 All the island laminate is bubbling up, half the trim is missing, and it’s time to say buh-bye, as my two-year-old likes to say. The cabinets are going to be transformed from this dark stain to a light and bright pure white. 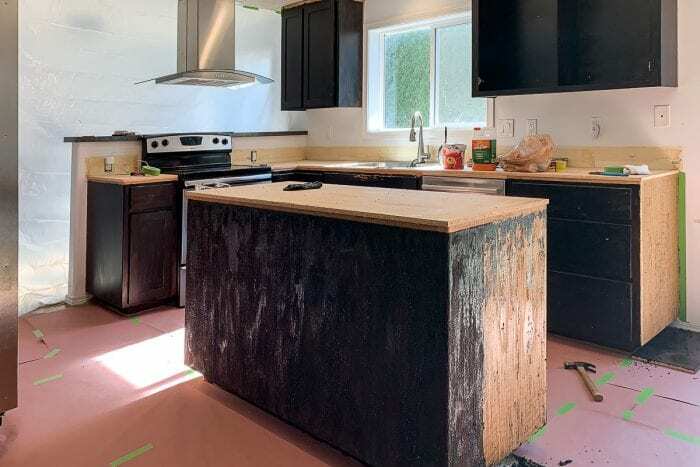 This is by far the biggest project we have to tackle for this kitchen reno since we expect it will take about a full week to finish between stripping the stain, sanding it, and cleaning it to prep for paint. Remember, we’ve got two little ones at home and very limited babysitters so we fit in project time where we can. The polyshades finish we did when we originally bought the house is coming up in many areas and does not give a clean, refined look. I can’t wait to remove that disaster of a stain job. We have lots more plans for the kitchen/dining area—including the gorgeous tile Jeffrey Court generously gave us—however, I just wanted to give you a rundown of the space today and show you the progress we’ve made so far this past week. On Saturday, my mom offered to take our girls so we could have a full day to power out a lot of the grunt work and smelly projects while the kids weren’t in the house. We were able to accomplish so much while they weren’t around and there’s no turning back now. I can’t wait to see this space start to come together. 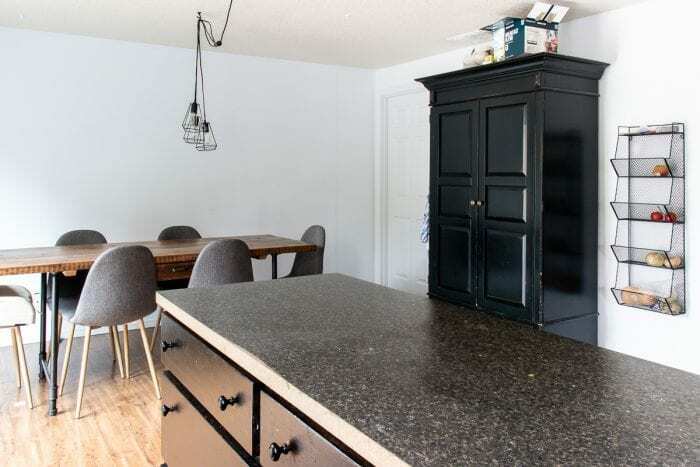 I’m going to put together a specific post all about how we stripped the cabinets, but that was the biggest project we tackled so far and we’re almost ready to paint! If you’ve never used a chemical stripper before, it’s like magic!! Check out the video above to see it in action. You apply the gel stripper, let it sit for an hour or so, and then scrape it off with a plastic stripping tool. After a few rounds of applying and scraping, we realized I’m better at applying the gel and Justin is better at scraping. We got a good system down and just powered through as much of the kitchen as possible before the kids got home. Justin managed to get the bar counter removed. There’s obviously still a lot to do, but I’m so excited with how much progress we’ve made so far and can’t wait to see the whole space come together. So, what’s on the official to-do list? Be sure to follow me on Instagram @acraftedpassion for daily updates on the progress we’re making and stay tuned for the complete design plans coming next week! I can’t wait to show you all the ideas I have. A huge thanks to our official sponsors!